The fairytale is realized in this licensed Disney Princess large jump with digital printing fit for any princess in training, no matter the occasion. Cinderella, Snow White, Sleeping Beauty, Belle, Jasmine and Ariel are smiling down on each soon-to-be princess as participants enjoy enchanting fun and imaginative play! 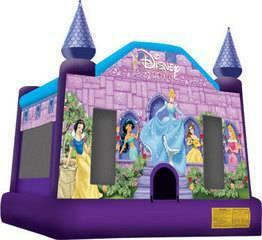 Ideal for a birthday party or kid-filled event, participants can jump for hours on end!